"F1 2016" redirects here. For the video game based on the 2016 Formula One season, see F1 2016 (video game). The 2016 season saw the grid expand to twenty-two cars with the addition of the Haas F1 Team entry. Renault returned to the sport as a constructor after a four-year absence following their takeover of Lotus prior to the start of the season. The calendar similarly expanded, with the return of the German Grand Prix. The European Grand Prix was also revived, with the event visiting a new circuit in Azerbaijan's capital city, Baku. Nico Rosberg won his only World Drivers' Championship title in the final race of the season. With nine wins and seven other podiums, Rosberg beat teammate and defending World Champion Lewis Hamilton by five points. In doing so, Rosberg followed the success of his father in 1982 and became the second son of a champion to become champion himself, a feat previously achieved by Damon Hill. 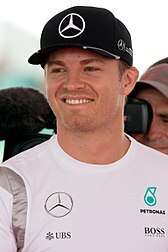 Rosberg announced his retirement from the sport shortly after winning the title. As of 2019, this was the only season in the 2010s decade won by a driver other than Sebastian Vettel or Lewis Hamilton. In the World Constructors' Championship, Mercedes successfully defended their title for the second consecutive year, beating Red Bull Racing by 297 points. Ferrari finished third overall, a further seventy points behind. The following teams and drivers took part in the 2016 Formula One World Championship. Teams competed with tyres supplied by Pirelli. Several team changes took place before the season began. Haas F1 Team, a team formed by NASCAR Sprint Cup Series team owner Gene Haas, joined the Formula One grid, becoming the first American team to compete since the unrelated Haas Lola team competed in 1986. [N 2] The team used power units supplied by Ferrari and a chassis developed by Dallara. Dallara had last participated in Formula One as the chassis manufacturer for HRT in 2010. Renault returned to Formula One as a full factory-supported team after they purchased Lotus from Genii Capital, the venture capital firm they had originally sold the same team to in 2010, and supplied engines to up until the end of 2014. Lotus's participation in the 2016 season was in question pending the resolution of a High Court case brought against the team by HM Revenue and Customs over unpaid PAYE tax. Both Red Bull Racing and Scuderia Toro Rosso underwent changes regarding their power unit supply. The former formally ended their nine-year partnership with engine supplier Renault at the end of the 2015 season, with the team citing the lack of performance from the Renault Energy-F1 2015 engine as a leading factor in the change. The team continued using Renault engines, but they were rebadged as TAG Heuer. Team principal Christian Horner named Renault's partnership with Mario Illien and his company Ilmor as a reason for staying with the manufacturer. Meanwhile, Scuderia Toro Rosso returned to using Ferrari power units, as they had done prior to the start of 2014, after Renault announced that they would no longer supply customer engines. The team used the type 060 power unit used by Ferrari teams in 2015 after Ferrari received approval from the World Motor Sport Council to supply year-old engines. Marussia applied for their team name to be changed to Manor Racing, a request granted in January 2016. The team adopted the formal name of "Manor Racing MRT" and switched from Ferrari to Mercedes power, with the team upgrading to a 2016-specification engine after having used a year-old Ferrari engine in 2015. The team underwent a management reshuffle following the resignation of team principal John Booth and sporting director Graeme Lowdon. Sauber underwent a change in ownership in the week prior to the Hungarian Grand Prix, with the team being purchased by Longbow Finance. Despite the acquisition and the retirement of team founder Peter Sauber, the team continued to use the Sauber identity. The driver line-ups saw a couple of changes prior to the 2016 season and three more while the season was underway. Romain Grosjean left Lotus at the end of the 2015 season. He signed with the newly formed Haas F1 Team for 2016, where he was joined by former Sauber driver Esteban Gutiérrez. Gutiérrez returned to competition after spending a season as Ferrari's test and reserve driver. After having taken over the Lotus team, Renault introduced a new driver-line up. Jolyon Palmer, the 2014 GP2 Series champion, made his race début in Melbourne. Palmer had previously made regular free practice appearances with the team when it was known as Lotus in 2015. Despite originally having signed a contract with Lotus for 2016, Pastor Maldonado announced he would not be driving for Renault after his sponsors were unable to fulfil their contractual obligations to the team. He was replaced by Kevin Magnussen, who was released by McLaren when they chose not to renew his contract after he entered a single race for the team in 2015. Manor did not retain their 2015 drivers either, opting to sign two rookies for its 2016 campaign: reigning Deutsche Tourenwagen Masters champion Pascal Wehrlein and GP2 Series regular Rio Haryanto, who became the first Indonesian driver to race in the championship. Will Stevens and Roberto Merhi—who drove for the team when it competed as Marussia—were not retained by the team. Both moved to the FIA World Endurance Championship with Manor Motorsport,[N 3] while Alexander Rossi, who also raced for the team in 2015, was moved to a test and reserve role while he joined the IndyCar Series. After suffering broken ribs and a pneumothorax injury as a result of an accident during the Australian Grand Prix, Fernando Alonso was ruled out of the Bahrain Grand Prix as a precaution after medical exams. McLaren reserve driver and reigning GP2 Series champion Stoffel Vandoorne made his Formula One début, replacing Alonso. Alonso returned to his seat for the Chinese Grand Prix two weeks later. Daniil Kvyat and Max Verstappen traded places ahead of the Spanish Grand Prix, with Verstappen promoted to Red Bull Racing and Kvyat returning to Scuderia Toro Rosso. Red Bull explained the decision to swap their drivers as being made to relieve pressure on Kvyat following criticism for his role in a first-lap accident in the Russian Grand Prix, and to ease ongoing tension between Verstappen and teammate Carlos Sainz Jr. at Toro Rosso. Rio Haryanto lost his race seat after the German Grand Prix, when his sponsors were unable to meet their financial obligations to the team. He stayed with the team, filling a testing and reserve role. His race seat was filled by 2015 GP3 Series champion and Renault test driver Esteban Ocon, who made his Formula One début with MRT at the Belgian Grand Prix. Nations that hosted a Grand Prix in 2016 are highlighted in green, with circuit locations marked with a black dot. Former host nations are shown in dark grey, and former host circuits are marked with a white dot. The following twenty-one Grands Prix took place in 2016. Formula One visited Azerbaijan for the first time in 2016 for the revival of the European Grand Prix. The race was run on a street circuit in the capital, Baku. There were a few revisions to the calendar from the previous season. The European Grand Prix returned to the calendar after a four-year absence. The race was moved from its previous home in Valencia to a brand-new street circuit in Baku, the capital of Azerbaijan. It was the first Grand Prix held in Azerbaijan. The German Grand Prix returned to the calendar as well, taking place at the Hockenheimring. The event had been cancelled in 2015 when a venue could not be secured. The circuit had previously hosted the race in 2014 as part of their agreement with the Nürburgring to alternate between venues, with the Hockenheimring hosting the race every even-numbered year. The Malaysian and Russian Grands Prix were subjected to date changes. The former was paired up with the Japanese Grand Prix in October, reverting to the time of year it was held in 1999–2000, while the latter was brought forward from its October date to May, becoming the fourth round of the season. Three races were contracted for 2016 but did not feature on the calendar. The Grand Prix of America was set to be held for the first time at the Port Imperial Street Circuit in New Jersey, in accordance with a fifteen-year contract. The race was originally scheduled to début in 2013, but was delayed for the fourth consecutive year. The Indian Grand Prix was removed from the calendar after the 2013 race, following a dispute over taxation. After several failed attempts at reviving the race in 2014 and 2015, the event's return was deferred until the 2016 season; however, it was once again left off the final calendar for the season. In 2006, Formula One Management had signed a seven-year contract to run the Korean Grand Prix at the Korea International Circuit beginning in 2010. However, the event was discontinued in 2014, and was omitted from the calendar for the third consecutive season in 2016. The FIA and Formula One Management were granted greater power to change the Sporting and Technical regulations and to make decisions affecting the governance of the sport. From the Monaco race weekend onwards, the FIA allowed drivers to choose alternative helmet designs for one race weekend per season, a practice previously prohibited as drivers were required to wear the same design to make them more recognisable to spectators and television audiences. Cars were required to be designed with a separate wastegate for exhaust gases to pass through in a bid to increase the noise of the cars following criticism since the introduction of the 2014 generation of engines. The FIA also opted to increase the number of tokens available for power unit development starting in 2016. While the initial plans would have given manufacturers fifteen tokens for the season, the number was raised to thirty-two, the same number as 2014, in order to allow struggling manufacturers such as Renault and Honda to improve their development. This decision also allowed further development on parts that were initially planned to be closed off, including the upper and lower crankcase, valve drive, crankshaft, air-valve system and ancillaries drive. Starting in 2016, the number of pre-season tests were reduced from three to two. The FIA formally increased the maximum events allowed in a season from 20 to 21 to accommodate the calendar's approval. Tyre supplier Pirelli introduced a fifth dry tyre compound known as "ultrasoft", with the manufacturer stating that they would only be available on street circuits. Pirelli further changed their approach to tyre supply in 2016, bringing three dry compounds to races instead of two. The compounds are made public two weeks before each event. Pirelli assigns two "choice" compounds, and a third set (the softest available regardless of Pirelli's selection) are given to teams reaching Q3. Drivers select their remaining ten tyre sets for the event between the three compounds and must use two dry compounds during the race. The stewards were given greater powers in enforcing track limits, with drivers required to stay between the white lines marking the edges of the circuit, except in cases of driver error. Any driver who caused the start of a race to be aborted would have been required to start the race from pit lane at the restart. The procedure for issuing gearbox penalties was amended as well, so that penalties were applied in the order that they were awarded, bringing the system in line with the wider grid penalty system. The usage of the Virtual Safety Car system was expanded to practice sessions as well to avoid the unnecessary use of red flags and session stoppages. The rules governing the use of the drag reduction system, which is deactivated when under Virtual Safety Car periods and full-course yellow flags, were also amended. Drivers were now allowed to make use of the device as soon as a Virtual Safety Car period has ended; while they previously had to wait two laps before the system was reactivated. The qualifying process was heavily revised two weeks before the season began. The three-period format first introduced in 2006 was retained, but with a progressive "knock-out" style of elimination. However, following widespread criticism of the format at the opening rounds, the format was abandoned after two races, and the system used between 2006 and 2015 re-introduced at the Chinese Grand Prix. The stewards' powers to monitor pit-to-car communications were broadened for the 2016 season, with race control able to monitor the radio feeds for each driver in real time and consult with engineering advisors to further monitor the content in a bid to crack down on driver coaching and the use of coded messages. Following a series of controversial penalties at the British and Hungarian Grands Prix and extended debate over the application of the rules, however, the FIA relaxed the restrictions on radio-communication which were introduced at the start of the season; starting with the German Grand Prix, applying them to the formation lap only. The process new drivers go through in order to qualify for a superlicence was changed as well, with additional restrictions—including the requirement that drivers complete eighty percent of two seasons from a series outside a recognised points-paying championship—put in place as part of the wider FIA Global Pathway. The new points system was retroactively applied, with all results for all eligible drivers automatically qualifying for superlicence points. The changes were introduced following the controversy which surrounded Max Verstappen qualifying for a superlicence at the age of sixteen after a single season competing in European Formula 3. Jolyon Palmer performing a practice pit stop in his Renault R.S.16. The black testing livery was later replaced. For the second year in a row, Hamilton decided not to exercise his option of switching his car number to 1, as was his prerogative as reigning World Champion, and would instead race with his career number 44. A pre-season tyre test was held at Circuit Paul Ricard in France in January, conducted by Pirelli to evaluate their wet weather tyres. The first pre-season team test was held a month later at the Circuit de Catalunya. Ferrari were fastest on three of the four testing days, with Nico Hülkenberg topping the time sheets for Force India on the third day. A second test, also in Barcelona, was conducted on 1–4 March. Ferrari ended the two tests with the best time set overall on the newly introduced ultra-soft tyres, while Mercedes covered the most distance in testing, almost 5,000 km (3,100 mi). The second four days of testing also saw the teams examine a proposed feature for driver head protection, dubbed the "halo". The season started with the Australian Grand Prix, and featured the newly introduced elimination-style qualifying format. This format was heavily criticized by teams, drivers, fans and the press, which led to a review of the format before the next race. The race ended with a 1–2 finish for Mercedes with Nico Rosberg taking victory from Lewis Hamilton in second. Sebastian Vettel and Ferrari finished on the last remaining step of the podium. Teammate Kimi Räikkönen retired with a suspected turbo failure on lap 21. On lap 16, whilst attempting to overtake Esteban Gutiérrez in the new Haas F1 car at turn three, Fernando Alonso crashed at high speed into the outside barrier before barrel-rolling and landing upside-down against the barrier. Gutiérrez ended up in the gravel trap with terminal rear tyre damage, and quickly went over to Alonso who managed to exit his cockpit unaided. Due to the huge amount of debris caused by the accident the race was red flagged, with the cars subsequently lining up in the pitlane. Romain Grosjean finished sixth in the other Haas and they became the first brand new team to score points in their inaugural race since Toyota did so in 2002. Stoffel Vandoorne made his debut in the Bahrain Grand Prix, scoring his first Formula One career point for McLaren. At the next race in Bahrain, Alonso was ruled out of taking part on medical grounds and was later revealed to have suffered broken ribs and a pneumothorax as a result of the previous race's collision, and was replaced by rookie Stoffel Vandoorne. Following the widespread criticism of the new qualifying format, the teams voted to abandon it and revert to the system used in 2015. However, in the week before the race weekend, the sport's Strategy Working Group over-ruled the teams in order to keep the elimination style for 2016. After qualifying, the system once again came under heavy fire with Hamilton securing pole position ahead of Rosberg and Vettel. The race saw Rosberg take his second consecutive victory of 2016 followed by Räikkönen and Hamilton, respectively. The Ferrari of Sebastian Vettel and the Renault of Jolyon Palmer retired before the race started with engine and hydraulics failures, respectively. Following a first-lap collision with Hamilton, Valtteri Bottas was penalised and given two points on his licence. At the next Grand Prix in China, the elimination style qualifying format was permanently dropped in favour of the previous format used between 2006 and 2015. This yielded Nico Rosberg's first pole position of the year after Hamilton suffered a number of setbacks both in qualifying and during the race itself, eventually finishing in seventh place, with his teammate taking his third consecutive victory of the 2016 season. The race finished with no retirements, a feat that has only been achieved six times. The next race in Russia featured a number of incidents on the first lap with Vettel and Kvyat getting involved. Kvyat hit Vettel twice forcing him to retire. Rosberg won the race with his teammate Lewis Hamilton finishing second after starting 10th and Rosberg achieved his first grand slam and extended his championship lead going into the European races. Max Verstappen became the youngest ever winner in Formula One when he won the Spanish Grand Prix. Before the race in Spain, Daniil Kvyat and Max Verstappen swapped places with Kvyat going to Toro Rosso and Verstappen to Red Bull. The start of the race saw Hamilton and Rosberg collide after Hamilton went to the grass and hit his teammate, handing the lead to Daniel Ricciardo. 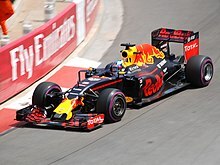 The race also saw the youngest race winner as Max Verstappen won the Grand Prix, defending against Kimi Räikkönen after Red Bull committed Ricciardo to an additional pit stop. At the next round in Monaco, Ricciardo took the first pole position of his career. Helped by the race starting behind the safety car he held the lead for 33 laps, but was unable to convert it to a win after his team made a costly error during his pit-stop. As a result, Lewis Hamilton inherited the lead and went on to win the race, his first of the season. Ricciardo finished second ahead of Sergio Pérez. Hamilton then went on to win the Canadian Grand Prix despite losing the lead to Sebastian Vettel at the start, reclaiming the position with a one-stop strategy while Vettel and Ferrari committed to two stops. Valtteri Bottas finished third, his first podium of the season. Rosberg won the returning European Grand Prix with his second grand slam of the season and of his career, ahead of Sebastian Vettel and Sergio Pérez, while Hamilton finished fifth after struggling with a software issue that limited his engine's ability to harvest energy. Hamilton took pole position at the next round in Austria while Rosberg started sixth after a grid penalty. The two drivers followed opposing strategies to be first and second after the pit stops, with Hamilton on the preferred racing tyre gradually catching Rosberg. The two made contact as Hamilton tried to pass Rosberg on the final lap; Hamilton won the race, while Rosberg broke his front wing and finished fourth behind Verstappen and Räikkönen. A stewards' inquiry found that Rosberg had caused an avoidable collision, and handed him a ten-second penalty, though the race result was not affected. Hamilton reduced the deficit to Rosberg to a single point at the next round in Great Britain, where difficult conditions saw the drivers contend with a drying circuit and varying grip levels. Hamilton established an early lead, while Rosberg and Verstappen fought over second place. Rosberg prevailed, but suffered a critical fault with his gearbox late in the race. Mercedes instructed him to reset the gearbox and to avoid using seventh gear or else risk a catastrophic failure, which prompted an investigation by the stewards for providing him with assistance. Rosberg was ultimately penalised for the radio call, having ten seconds added to his race time, which demoted him to third behind Verstappen. Lewis Hamilton took the championship lead from Nico Rosberg at the next round in Hungary, leading another Mercedes 1–2 finish to gain a six-point lead in the Drivers' Championship standings. The Grand Prix was marked by controversy: Rosberg secured pole position on a drying circuit in qualifying after McLaren's Fernando Alonso spun in front of him necessitating a double waved yellow flag. Although race stewards confirmed that Rosberg had slowed, he nevertheless secured pole with his lap time. The race saw Jenson Button fall afoul of new restrictions on pit-to-car communications that demanded that any car with an issue serious enough to require the intervention of the team be pitted or retired. Button reported a brake issue – which was later revealed to be a faulty sensor – and was penalised for unauthorised assistance. Following penalties for Rosberg and Button for unauthorised pit-to-car communications in the previous races, the FIA repealed all regulations for the next round in Germany. Hamilton further consolidated his championship lead, beating Rosberg off the line at the start; for his part, Rosberg was caught by the Red Bulls of Daniel Ricciardo and Max Verstappen and was unable to pass them. Rosberg's race was further complicated by a time penalty for an aggressive pass on Verstappen that forced the Red Bull driver wide. However, Hamilton remained pessimistic about his position as championship leader, as with nine races left in the season, he was anticipating grid penalties for exceeding his engine allocation. With Mercedes opting to take a series of grid penalties to build up a stockpile of components, Hamilton was forced to start the next race in Belgium from the back of the grid. He took advantage of first-lap contact between Vettel, Räikkönen and Verstappen to work his way through the field before a heavy accident involving Kevin Magnussen at Eau Rouge forced the race to be temporarily stopped. When the race resumed, Nico Rosberg led the race until the chequered flag, while Hamilton ultimately finished third after being unable to catch Daniel Ricciardo. Further down the order, Verstappen was subject to increasing criticism over his driving tactics after being caught in several incidents with Räikkönen and Sergio Pérez, while Esteban Ocon finished sixteenth on début for MRT. Rosberg reduced Hamilton's championship lead to two points at the next round in Italy, taking advantage of a slow start by Hamilton to establish an early lead that went unchallenged through the race. Hamilton dropped as low as fifth at the start, recovering to fourth in the opening laps and got ahead of the Ferraris of Vettel and Räikkönen by making one pit-stop less. Vettel went on to finish third—his first podium finish in five races—with Räikkönen fourth as the team introduced upgrades to the type 061 power unit in the hopes of recovering second place in the World Constructors' Championship from Red Bull. Lewis Hamilton's engine failure in Malaysia was a key moment in the Drivers' Championship fight. Rosberg reclaimed the championship lead in Singapore, qualifying on pole while Hamilton was forced to settle for third after struggling with mechanical issues and driving errors. A late pit stop during the race by Mercedes saw Hamilton pass Kimi Räikkönen for third which he held until the end of the race. Red Bull Racing decided to pit Daniel Ricciardo from second to prevent coming under threat from Hamilton. Rosberg decided to stay out because his lead over Ricciardo was not large enough to pit and stay ahead, but was able to hold on to first place to take the win. Ricciardo made late efforts to catch Rosberg from 27 seconds behind, but could not quite catch him, finishing 0.6 seconds behind at the chequered flag. With Hamilton finishing third, Rosberg turned a two-point deficit into an eight-point lead. Mercedes's streak of ten consecutive wins came to an end in Malaysia. Hamilton established an early lead, but retired sixteen laps from the end of the race when his engine failed, leaving Daniel Ricciardo in control of the race. Nico Rosberg was turned around by Sebastian Vettel in a first corner accident that eliminated Vettel and forced Rosberg to work his way up through the field. Ricciardo raced Max Verstappen for the lead when Hamilton's retirement triggered a Virtual Safety Car, prompting Red Bull to pit both drivers at the same time. On fresher tyres, Ricciardo was able to withstand pressure from Verstappen to win his first race since the 2014 Belgian Grand Prix. Nico Rosberg finished third despite having ten seconds added to his race time for contact with Kimi Räikkönen, extending his championship lead to twenty-three points. Rosberg further extended his championship lead to thirty-three points in Japan, starting the race from pole and winning it. Meanwhile, Hamilton suffered a poor start, slipping from second on the grid to eighth by the end of the first lap. He was forced to run a race of recovery, using pit strategy to reclaim third place going into the final phase of the race, but was unable to pass Max Verstappen, and finished third. The result secured Mercedes's third consecutive World Constructors' Championship title. With the championship leaving Asia for the Americas, Hamilton gradually started to erode Rosberg's championship lead. Mercedes scored a 1–2 finish in the United States, with Rosberg taking advantage of a Virtual Safety Car triggered by Max Verstappen to take second place from Daniel Ricciardo. Hamilton led another Mercedes 1–2 in Mexico, with the race overshadowed by a late incident that saw Verstappen run wide and cut part of the circuit, triggering an angry radio message from Sebastian Vettel. Vettel inherited third place when Verstappen was penalised, only to be penalised himself for dangerous driving when defending against Ricciardo. The final amended results saw Ricciardo finish third, ahead of Verstappen and Vettel. Treacherous weather conditions saw the Brazilian Grand Prix subject to several race stoppages—most notably after Kimi Räikkönen crashed on the main straight—but when racing resumed, Mercedes took another 1–2 finish. Hamilton won the race ahead of Rosberg for the third time in as many races, with Max Verstappen completing the podium. Going into the final round at Abu Dhabi, Rosberg led Hamilton by twelve points. Hamilton secured pole ahead of Rosberg and led from the start. In the closing laps of the race, he slowed down in attempt to allow other drivers to catch and pass Rosberg, despite repeated instructions from Mercedes not to risk losing the race to Sebastian Vettel, who used pit strategy to bring himself into contention and was quickly catching up. Hamilton went on to win the race, while Rosberg secured his maiden Drivers' Championship title with second place. Five days after winning the title, Rosberg announced his immediate retirement from the sport at the FIA Prize Giving Ceremony in Vienna. He was the first reigning champion to do so since Alain Prost in 1993. Daniel Ricciardo took the first pole position of his career in Monaco. The standings are sorted by best result, rows are not related to the drivers. In case of tie on points, a certain position is achieved determines the outcome. ^ Red Bull Racing uses Renault R.E.16 power units. For sponsorship purposes, these engines are rebadged as "TAG Heuer". ^ An American-registered constructor known as US F1 was accepted to the grid in 2010, but the team collapsed before the start of that season. ^ Although the Manor Motorsport team shares a name with Manor Racing and was established by former Manor Racing personnel, the two teams are separate entities. ^ a b In the event that two or more drivers or constructors achieved the same best result an equal number of times, their next-best result would be used, and so on. If two or more or constructors would have achieved equal results an equal number of times, the FIA would have nominated the winner according to such criteria as it thought fit. ^ a b c d e f g h "FIA confirms 2016 calendar". Formula1.com. Formula One World Championship Limited. 2 December 2015. Retrieved 2 December 2015. ^ Noble, Jonathan (2 September 2014). "Gene Haas changes the name of his new Formula 1 team". Autosport. Haymarket Media Group. Archived from the original on 23 January 2018. ^ a b c "Formula 1 Teams". Formula1.com. Formula One World Championship Limited. Archived from the original on 29 February 2016. Retrieved 29 February 2016. ^ "Rosberg wins in Japan as Mercedes seal constructors' crown". Formula1.com. Formula One World Championship Limited. 9 October 2016. Retrieved 9 October 2016. ^ a b c "Bourne Identity". Haas F1 Team. 11 March 2016. Retrieved 16 September 2016. ^ a b c d "Mercedes-Benz F1 W07 Hybrid Completes First Laps at Silverstone". Daimler. 19 February 2016. Archived from the original on 8 April 2018. ^ "Introducing the McLaren-Honda MP4-31". mclaren.com. McLaren Honda. Archived from the original on 29 February 2016. Retrieved 29 February 2016. ^ "R.E.16". Renault Sport. Archived from the original on 29 February 2016. Retrieved 29 February 2016. ^ a b "STR11" (in Italian). Scuderia Toro Rosso. Archived from the original on 19 August 2016. Retrieved 16 September 2016. ^ a b "2016 Final F1 Entry List". fia.com. FIA. Archived from the original on 19 February 2016. Retrieved 19 February 2016. ^ "Ferrari fastest as pre-season testing concludes at Barcelona". 4 March 2016. Retrieved 7 March 2016. ^ "2016 Australian Grand Prix – Entry List" (PDF). FIA.com. Fédération Internationale de l'Automobile. 17 March 2016. Archived from the original on 17 March 2016. ^ "2016 Bahrain Grand Prix – Entry List" (PDF). FIA.com. Fédération Internationale de l'Automobile. 31 March 2016. Archived from the original on 31 March 2016. ^ "2016 Chinese Grand Prix – Entry List" (PDF). FIA.com. Fédération Internationale de l'Automobile. 14 April 2016. Archived from the original on 14 April 2016. ^ "2016 Russian Grand Prix – Entry List" (PDF). FIA.com. Fédération Internationale de l'Automobile. 28 April 2016. Archived from the original on 29 April 2016. ^ "2016 Spanish Grand Prix – Entry List" (PDF). FIA.com. Fédération Internationale de l'Automobile. 12 May 2016. Archived from the original on 12 May 2016. ^ "2016 British Grand Prix – Entry List" (PDF). FIA.com. Fédération Internationale de l'Automobile. 7 July 2016. Archived from the original on 7 July 2016. ^ "2016 Belgian Grand Prix – Entry List" (PDF). FIA.com. Fédération Internationale de l'Automobile. 25 August 2016. Archived from the original on 1 September 2016. ^ "2016 United States Grand Prix – Entry List" (PDF). FIA.com. Fédération Internationale de l'Automobile. 20 October 2016. Archived from the original on 21 October 2016. ^ "Haas confirms debut will be in 2016". ESPN. 4 June 2014. Retrieved 4 June 2014. ^ Noble, Jonathan; Rencken, Dieter (3 February 2010). "Team US F1 shuts down operation". Autosport. Haymarket Media Group. Retrieved 24 October 2015. ^ "Ferrari power unit for Haas F1 Team". Ferrari. Ferrari. 3 September 2014. Archived from the original on September 4, 2014. ^ "Dallara starts work on 2016 Haas Formula One car". 23 January 2015. Retrieved 25 June 2015. ^ Noble, Jonathan (12 June 2009). "Fifteen teams lodged F1 entries". Autosport. Haymarket Media Group. Retrieved 25 October 2015. ^ Parkes, Ian (3 December 2015). "Renault confirms works Formula 1 return with Lotus takeover". Autosport. Haymarket Media Group. Retrieved 4 December 2015. ^ Baldwin, Alan (25 September 2017). "Ecclestone hopes Renault come to the party". Reuters. ^ Esler, William (28 September 2015). "Renault signs a letter of intent to buy a controlling stake in Lotus". Sky Sports F1. BSkyB. Retrieved 28 September 2015. ^ "Red Bull secures F1 engine deal for 2016 season, Christian Horner confirms". abc.net.au. Australian Broadcasting Corporation. 27 November 2015. Retrieved 28 November 2015. ^ Barretto, Lawrence (4 December 2015). "Red Bull announces it will have TAG Heuer-branded F1 engine in 2016". Autosport. Haymarket Media Group. Archived from the original on 4 December 2015. Retrieved 4 December 2015. ^ "Toro Rosso hush on engine talks". Fox Sports Asia. Fox Sports. 19 September 2015. Archived from the original on September 29, 2015. Retrieved 21 September 2015. ^ "Toro Rosso to use 2015-spec Ferrari engines next season". Formula1.com. Formula One World Championship Limited. Retrieved 27 May 2016. ^ "FIA Announces World Motor Sport Council Decisions". Fédération Internationale de l'Automobile. 3 December 2015. Archived from the original on 11 April 2017. ^ "Former Marussia F1 team to compete as Manor Racing in 2016". Autosport. Haymarket Media Group. 19 January 2016. Archived from the original on 19 January 2016. Retrieved 19 January 2016. ^ Galloway, James (1 October 2015). "Mercedes to supply Manor with engines from 2016 season". Sky Sports F1. BSkyB. Retrieved 1 October 2015. ^ Anderson, Ben; Noble, Jonathan (20 February 2015). "Manor F1 team agrees to use 2014 Ferrari engines". Autosport. Haymarket Media Group. Retrieved 24 October 2015. ^ Adam, Mitchell (15 November 2015). "Manor F1 team hires ex-McLaren man Dave Ryan as racing director". Autosport. Haymarket Media Group. Archived from the original on 11 April 2018. ^ "Longbow Finance S.A. will acquire Sauber Holding AG". Sauber F1 Team. 20 July 2016. Archived from the original on 17 October 2017. ^ "Haas F1 Team Selects Grosjean as Driver". 29 September 2015. Retrieved 30 September 2015. ^ Parkes, Ian (29 September 2015). "Haas Formula 1 team announces Romain Grosjean as first driver". Autosport. Haymarket Media Group. Retrieved 29 September 2015. ^ "Lotus von Grosjean-Abgang kalt erwischt – Steigt Palmer auf?" [Lotus stunned by Grosjean exit – Will Palmer step up?]. Motorsport-total.com. Axel Springer Auto Verlag GmbH. 25 September 2015. Retrieved 25 September 2015. ^ Elizalde, Pablo (31 October 2015). "Haas F1 announces Gutierrez for 2016". Autosport. Haymarket Media Group. Retrieved 31 October 2015. ^ "Move On Up! – Jolyon Palmer announced as race driver for 2016". Lotus F1 Team. 23 October 2015. Archived from the original on 26 October 2015. Retrieved 23 October 2015. ^ Barretto, Lawrence (29 October 2015). "Lotus to run Jolyon Palmer in practice at rest of 2015 Grands Prix". Autosport. Haymarket Media Group. Archived from the original on 4 November 2015. Retrieved 4 November 2015. ^ "Lotus F1 team confirms Pastor Maldonado for 2016 season". 20 September 2015. Retrieved 4 February 2016. ^ Edmondson, Laurence (1 February 2016). "Pastor Maldonado confirms F1 exit". ESPN. Archived from the original on 2 February 2016. Retrieved 2 February 2016. ^ "Renault launch 2016 car with Kevin Magnussen alongside Jolyon Palmer". Sky Sports F1. BSkyB. 4 February 2016. Retrieved 6 March 2016. ^ "Driver Kevin Magnussen leaving McLaren-Honda F1 team". Autoweek. Crain Communications, LLC. 6 October 2015. Retrieved 18 October 2015. ^ Barretto, Lawrence (18 February 2016). "Rio Haryanto gets second Manor Formula 1 seat for 2016 season". Autosport. Haymarket Media Group. Archived from the original on 18 February 2016. Retrieved 18 February 2016. ^ "Ex-Formula 1 driver Will Stevens moves to Manor WEC LMP2 team". Autosport. Haymarket Media Group. Archived from the original on 1 July 2017. ^ "Ex-Manor F1 driver Roberto Merhi joins reborn team in WEC LMP2". Autosport. Haymarket Media Group. 30 March 2016. Archived from the original on 1 July 2017. ^ Reiman, Samuel (23 February 2016). "Alexander Rossi confirmed at Andretti". Fox Sports. Retrieved 23 February 2016. ^ Barretto, Lawrence (9 March 2016). "Andretti IndyCar driver Alexander Rossi to act as Manor F1 reserve". Autosport. Haymarket Media Group. Archived from the original on 9 March 2016. Retrieved 9 March 2016. ^ "Fernando Alonso out of Bahrain F1 Grand Prix due to broken ribs, injured lung in Australian crash". abc.net.au. Australian Broadcasting Corporation. 31 March 2016. Retrieved 1 April 2016. ^ Elizalde, Pablo (31 March 2016). "Alonso will not race in the Bahrain GP". motorsport.com. Archived from the original on 31 March 2016. Retrieved 31 March 2016. ^ "Vandoorne: I maximised my opportunity". www.formula1.com. Retrieved 10 April 2016. ^ Morlidge, Matt (10 August 2016). "Esteban Ocon steps up to replace Rio Haryanto at Manor". Sky Sports F1. BSkyB. Archived from the original on 10 August 2016. Retrieved 10 August 2016. ^ Freeman, Glenn (11 August 2016). "Rio Haryanto accepts Manor F1 reserve driver offer after losing seat". Autosport. Haymarket Media Group. Archived from the original on 27 August 2017. ^ Barretto, Lawrence (10 August 2016). "Manor F1 team replaces Rio Haryanto with Esteban Ocon". Autosport. Haymarket Media Group. Archived from the original on 10 August 2016. Retrieved 10 August 2016. ^ Walker, Kate (5 December 2015). "Analysis: Azerbaijan's plan to make the F1 race pay off". Motor Sport. Retrieved 9 December 2015. ^ "The F1 Ticket Store". Formula1.com. Formula One World Championship Limited. Retrieved 5 December 2015. ^ "German Grand Prix F1 race coming back to Hockenheim in 2016". Autoweek. 10 May 2015. Retrieved 11 July 2015. ^ "Hockenheim tickets set to go on sale". GPUpdate.net. JHED Media BV. 30 July 2015. Archived from the original on 23 August 2015. ^ "New Jersey Formula One race shelved until at least 2016". autoweek.com. 28 July 2014. Retrieved 28 July 2014. ^ a b Sylt, Christian (24 December 2013). "New Jersey Grand Prix organizers in breach of contract says Ecclestone". Auto Week. Archived from the original on June 8, 2014. Retrieved 28 July 2014. ^ "Indian Grand Prix must wait until at least 2016, says Bernie Ecclestone". The Guardian. 6 March 2014. Archived from the original on 18 March 2014. ^ "Korean GP dropped from F1 calendar". PlanetF1. 7 January 2015. Archived from the original on 5 February 2015. Retrieved 1 February 2015. ^ "Ecclestone, Todt awarded new F1 powers". speedcafe.com. 3 December 2015. Archived from the original on 5 December 2015. Retrieved 3 December 2015. ^ Parkes, Ian; Anderson, Ben (26 May 2016). "Formula 1 drivers now allowed one helmet livery change per season". Autosport. Haymarket Media Group. Archived from the original on 27 May 2016. Retrieved 27 May 2016. ^ Noble, Jonathan (18 February 2015). "F1 helmet design changes in-season to be banned". Autosport. Haymarket Media Group. Archived from the original on 27 May 2016. Retrieved 27 May 2016. ^ a b c d "Engine, exhaust changes to make cars louder for 2016 season". Sky Sports F1. BSkyB. 30 September 2015. Retrieved 2 October 2015. ^ Parkes, Ian (2 December 2015). "FIA clears Ferrari/Toro Rosso Formula 1 engine deal for 2016". Autosport. Haymarket Media Group. Archived from the original on 2 December 2015. Retrieved 2 December 2015. ^ "Standing restarts among 2015 rule changes". ESPN. 26 June 2014. Archived from the original on 5 February 2016. Retrieved 28 July 2014. ^ a b "FIA announces Motor Sport Council decisions". FIA. 2 December 2015. Archived from the original on 29 February 2016. Retrieved 29 February 2016. ^ Saunders, Nate (23 October 2015). "Pirelli asks fans to decide 'ultra-soft' compound colour". Archived from the original on 7 July 2017. ^ Elizalde, Pablo (24 November 2015). "Pirelli 'ultrasoft' will only be used on street circuits". Motorsport. Motorsport.com, Inc. Retrieved 23 February 2015. ^ a b c Parkes, Ian (2 December 2015). "F1 teams to get more choice between Pirelli dry compounds in 2016". Autosport. Haymarket Media Group. Retrieved 3 December 2015. ^ Parkes, Ian (3 December 2015). "F1 tyre choices to be kept secret until two weeks before GPs in 2016". Autosport. Haymarket Media Group. Archived from the original on 4 December 2015. Retrieved 4 December 2015. ^ "Drag Reduction System". Formula1.com. Formula One World Championship Limited. Archived from the original on 2 October 2015. Retrieved 3 December 2015. ^ "FIA announces World Motorsport Council decisions". FIA. ^ Lines, Chris (19 March 2016). "F1 qualifying format slammed as Hamilton wins Australia pole". Associated Press. Melbourne: AP Sports. Associated Press. Archived from the original on 19 March 2016. Retrieved 19 March 2016. ^ Weaver, Paul (19 March 2016). "F1 qualifying universally condemned as Lewis Hamilton grabs Melbourne pole". The Guardian. Melbourne: Guardian Media Group. Archived from the original on 19 March 2016. Retrieved 19 March 2016. ^ Morlidge, Matthew (19 March 2016). "New qualifying format slammed as 'unacceptable' and 'embarrassing'". Sky Sports. BSkyB. Archived from the original on 19 March 2016. Retrieved 19 March 2016. ^ Parkes, Ian (18 March 2016). "Formula 1 radio coaching had been 'intolerable' - FIA's Whiting". Autosport. Haymarket Media Group. Archived from the original on 11 April 2018. ^ Parkes, Ian (28 July 2016). "Formula 1's radio restrictions to be lifted from German GP". Autosport. Haymarket Media Group. Archived from the original on 3 August 2016. ^ "Formula 1 superlicence system to be reviewed". Racer.com. Racer Media & Marketing, Inc. 12 September 2014. Archived from the original on 2014-09-13. Retrieved 13 September 2014. ^ a b "Supercars added to F1 Superlicence system". speedcafe.com. 29 June 2016. Retrieved 29 June 2016. ^ a b "New Super Licence points system from 2016". Formula1.com. Formula One World Championship Limited. 6 January 2015. Archived from the original on 8 January 2015. Retrieved 6 January 2015. ^ "About Formula 4". formula4.com.au. Confederation of Australian Motor Sport. Retrieved 25 October 2015. ^ Parkes, Ian. "F1 news: Pirelli begins wet weather Formula 1 test at Paul Ricard". Autosport. Haymarket Media Group. Retrieved 25 January 2016. ^ a b "F1 in 2016: Schedule and calendar, driver line-ups and test dates". Sky Sports F1. BSkyB. 3 February 2016. Archived from the original on 5 February 2016. Retrieved 5 February 2016. ^ Parkes, Ian (22 February 2016). "Barcelona F1 test: Sebastian Vettel and Ferrari top day one". Autosport. Haymarket Media Group. Archived from the original on 25 February 2016. Retrieved 25 February 2016. ^ Barretto, Lawrence (23 February 2016). "Barcelona F1 test: Sebastian Vettel fastest again on day two". Autosport. Haymarket Media Group. Archived from the original on 25 February 2016. Retrieved 25 February 2016. ^ Barretto, Lawrence (25 February 2016). "Kimi Raikkonen tops final day of first 2016 Barcelona F1 test". Autosport. Haymarket Media Group. Archived from the original on 25 February 2016. Retrieved 25 February 2016. ^ Parkes, Ian (24 February 2016). "Barcelona F1 testing: Force India's Hulkenberg on top, Haas second". Autosport. Haymarket Media Group. Archived from the original on 25 February 2016. Retrieved 25 February 2016. ^ Parkes, Ian; Adam, Mitchell (3 March 2016). "Kimi Raikkonen tests F1's halo head protection system on Ferrari". Autosport. Haymarket Media Group. Archived from the original on 17 March 2016. Retrieved 17 March 2016. ^ Anderson, Ben (11 March 2016). "FIA releases Formula 1's new qualifying rules before Australian GP". Autosport. Haymarket Media Group. Archived from the original on 17 March 2016. Retrieved 17 March 2016. ^ a b Parkes, Ian (24 March 2016). "F1 gives elimination qualifying system reprieve for the Bahrain GP". Autosport. Haymarket Media Group. Archived from the original on 25 March 2016. ^ "Nico Rosberg wins incident-packed Australian GP". BBC Sport. 20 March 2016. Retrieved 1 December 2016. ^ a b "Rosberg wins drama-filled Melbourne race". Formula1.com. Formula One World Championship Limited. 20 March 2016. Archived from the original on 7 November 2017. ^ a b Benson, Andrew (22 March 2016). "Fernando Alonso's F1 crash: Would the halo have trapped him?". BBC Sport. Archived from the original on 27 March 2016. ^ "Race red flagged after Alonso/Gutiérrez clash". GPUpdate.net. JHED Media BV. 20 March 2016. Archived from the original on 2 May 2017. ^ "Sixth place 'a win' for Haas - Grosjean". Formula1.com. Formula One World Championship Limited. 20 March 2016. Archived from the original on 30 November 2017. Retrieved 2017-11-30. ^ Barretto, Lawrence; Beer, Matt (31 March 2016). "Lung and rib injuries cause of Fernando Alonso missing Bahrain GP". Autosport. Haymarket Media Group. Archived from the original on 30 November 2017. ^ Parkes, Ian (20 March 2016). "F1 team heads agree unanimously to revert to old qualifying format". Autosport. Haymarket Media Group. Archived from the original on 27 March 2016. ^ Morlidge, Matthew (3 April 2016). "2016 Bahrain Grand Prix: Conclusions from qualifying". Sky Sports F1. BSkyB. Archived from the original on 3 April 2016. ^ Lines, Chris (2 April 2016). "Hamilton edges Rosberg to take pole position at Bahrain GP". Associated Press. Sakhir: AP Sports. Archived from the original on 3 April 2016. ^ Hughes, Mark (4 April 2016). "Twenty Bahrain Grand Prix facts". Motor Sport Magazine. Archived from the original on 8 April 2016. ^ "2016 Bahrain Grand Prix – Stewards' decision Document 35". FIA.com. Fédération Internationale de l'Automobile. 3 April 2016. Archived from the original on 23 April 2018. ^ Parkes, Ian (7 April 2016). "F1 reverts to old qualifying format from Chinese Grand Prix". Autosport. Haymarket Media Group. Archived from the original on 8 April 2016. ^ "Qualifying - Rosberg beats Ricciardo to pole in Shanghai". Formula1.com. Formula One World Championship Limited. 16 April 2016. Archived from the original on 1 December 2017. ^ "Full house – the rare occasions every car has finished". Formula1.com. Shanghai: Formula One World Championship Limited. 22 April 2016. Retrieved 22 April 2016. ^ Johnson, Daniel (1 May 2016). "Sebastian Vettel and Daniel Ricciardo demand Daniil Kvyat apologises after ruining Russian GP". The Telegraph. Archived from the original on 18 May 2016. ^ "Red Bull drop Daniil Kvyat and replace him with Max Verstappen". The Guardian. 5 May 2016. Archived from the original on 18 May 2016. ^ a b Benson, Andrew (15 May 2016). "Lewis Hamilton & Nico Rosberg crash as Max Verstappen wins in Spain". BBC Sport. Barcelona. Archived from the original on 3 September 2017. ^ Pugmire, Jerome (28 May 2016). "Ricciardo all smiles at Monaco GP, Hamilton woes continues". Auto Racing. Monaco: AP Sports. Archived from the original on 28 October 2017. ^ a b c Benson, Andrew (31 May 2016). "Lewis Hamilton wins epic Monaco Grand Prix over Daniel Ricciardo". BBC Sport. Monaco. Archived from the original on 31 May 2016. ^ a b Benson, Andrew (12 June 2016). "Lewis Hamilton wins Canadian GP after tense fight with Sebastian Vettel". BBC Sport. Archived from the original on 3 December 2016. ^ Richard, Giles (2 July 2016). "Lewis Hamilton takes pole at Austrian F1 Grand Prix amid the showers". The Guardian. Spielberg, Austria: Guardian Media Group. Archived from the original on 4 July 2016. ^ a b Benson, Andrew (3 July 2016). "Lewis Hamilton wins Austrian Grand Prix after Nico Rosberg collision". BBC Sport. Archived from the original on 14 May 2017. ^ a b Benson, Andrew (10 July 2016). "Lewis Hamilton wins fourth British Grand Prix of his career". BBC Sport. Archived from the original on 13 July 2016. ^ Meagher, Gerard (10 July 2016). "F1: Lewis Hamilton wins British Grand Prix – as it happened". The Guardian. Archived from the original on 10 July 2016. Retrieved 10 July 2016. ^ Freeman, Glenn; Barretto, Lawrence (10 July 2016). "F1 news: Nico Rosberg certain Mercedes' British GP radio didn't break rules". Autosport. Haymarket Media Group. Archived from the original on 18 July 2016. ^ a b Hughes, Mark (25 July 2016). "2016 Hungarian Grand Prix report". Motor Sport Magazine. Archived from the original on 11 November 2017. ^ Parkes, Ian (23 July 2016). "F1 news: Nico Rosberg keeps Hungarian GP pole after yellow flag probe". Autosport. Haymarket Media Group. Archived from the original on 26 July 2016. ^ Parkes, Ian (21 July 2016). "F1 news: F1 radio ban: FIA tightens rules on messages before Hungarian GP". Autosport. Haymarket Media Group. Archived from the original on 6 December 2017. ^ Parkes, Ian (28 July 2016). "Formula 1's radio restrictions to be lifted from German GP". Autosport. Haymarket Media Group. Archived from the original on 2 June 2017. ^ a b Hughes, Mark (1 August 2016). "2016 German Grand Prix". Motor Sport Magazine. Archived from the original on 11 November 2017. ^ Barretto, Lawrence (27 August 2016). "F1 news: Belgian GP: Hamilton to start at the back following further penalty". Autosport. Haymarket Media Group. Archived from the original on 29 August 2016. ^ a b Hughes, Mark (29 August 2017). "2016 Belgian Grand Prix". Motor Sport Magazine. Archived from the original on 4 November 2016. Retrieved 2017-12-06. ^ Benson, Andrew (28 August 2016). "Lewis Hamilton finishes third from Belgian GP back row, Nico Rosberg wins". BBC Sport. Archived from the original on 17 May 2017. ^ "Vettel plans to talk to Verstappen over conduct". GPUpdate.net. JHED Media BV. 29 August 2016. Archived from the original on 23 February 2017. ^ a b Benson, Andrew (4 September 2016). "Lewis Hamilton battles to second as Nico Rosberg wins Italian Grand Prix". BBC Sport. Archived from the original on 3 December 2016. ^ Barretto, Lawrence (5 September 2016). "F1 news: Ferrari's latest F1 engine upgrade 'not magic', Raikkonen says". Autosport. Haymarket Media Group. Archived from the original on 6 December 2017. ^ "Formula One - 2016 Standings". Formula One. Retrieved 20 April 2019. ^ Anderson, Ben (17 September 2016). "F1 news: Nico Rosberg claims Singapore GP pole ahead of Daniel Ricciardo". Autosport. Haymarket Media Group. Archived from the original on 6 December 2017. ^ a b Hughes, Mark (19 September 2016). "2016 Singapore Grand Prix". Motor Sport Magazine. Archived from the original on 11 November 2017. ^ Benson, Andrew (18 September 2016). "Nico Rosberg holds off Daniel Ricciardo in Singapore, with Lewis Hamilton third". BBC Sport. Archived from the original on 10 May 2017. ^ a b c Barretto, Lawrence (2 October 2016). "Daniel Ricciardo wins F1 Malaysian GP as Lewis Hamilton retires". Autosport. Haymarket Media Group. Archived from the original on 9 October 2016. ^ a b c Benson, Andrew (2 October 2016). "Lewis Hamilton out in Malaysia as Daniel Ricciardo wins". BBC Sport. Archived from the original on 3 December 2016. ^ a b Hughes, Mark (10 October 2016). "2016 Japanese Grand Prix". Motor Sport Magazine. Archived from the original on 11 November 2017. ^ a b Benson, Andrew (9 October 2016). "Lewis Hamilton battles to third as Nico Rosberg wins in Japan". BBC Sport. Archived from the original on 17 May 2017. ^ a b Benson, Andrew (23 October 2016). "Lewis Hamilton takes 50th win at United States GP". BBC Sport. Archived from the original on 31 May 2017. ^ a b Hughes, Mark (31 October 2016). "2016 Mexican Grand Prix". Motor Sport Magazine. Archived from the original on 6 November 2016. ^ Benson, Andrew (30 October 2016). "Lewis Hamilton wins Mexican Grand Prix to keep title chase alive". BBC Sport. Archived from the original on 28 April 2017. Retrieved 1 December 2016. ^ Benson, Andrew (13 November 2016). "Lewis Hamilton keeps F1 title race alive with Brazilian Grand Prix win". BBC Sport. Archived from the original on 7 January 2017. ^ Barretto, Lawrence (17 November 2016). "Nico Rosberg unsure how to approach F1 title-deciding Abu Dhabi GP". Autosport. Motorsport Network. Archived from the original on 4 May 2017. ^ "Abu Dhabi GP: Lewis Hamilton wins the battle but loses the war". Sky Sports F1. BSkyB. 27 November 2016. Archived from the original on 6 December 2017. ^ "Nico Rosberg retires: World champion quits Formula 1 five days after title win". BBC Sport. 2 December 2016. Retrieved 12 October 2017. ^ "2015 Formula one Sporting Regulations". FIA.com. FIA. 10 July 2015. Archived from the original on 6 December 2015. Retrieved 29 August 2015. ^ "2016 Formula One World Championship - Drivers' Championship". Fédération Internationale de l'Automobile. Archived from the original on 27 November 2016. Retrieved 27 November 2016. ^ "2016 Formula One World Championship - Constructors' Championship". Fédération Internationale de l'Automobile. Archived from the original on 27 November 2016. Retrieved 27 November 2016.